IT’S A WONDERFUL, GIDDY kind of feeling when you accomplish something. I have been working for so long on my little story-turned-novel — almost 14 years — that I was not sure it would ever happen. But, on Monday, I finally laid the first draft to rest. It is done. (insert Happy Dance here) And for that, I thank God! Really and truly thank Him for the persistence and perseverance to bring this phase to completion. Even though I decided to put it aside for a few days before beginning the very necessary rewrites and editing, it is hard to concentrate on anything else. My mind just won’t let it go. This is definitely a double-edged sword. On the one hand, I really need to refresh my mind, relax, and get on with life — with the mundane things that need to be done. On the other, it’s nice to know the writerly portion of my brain wants me to hunker down (even if it is being a little too persistent and wants to begin the editing now) — but since I refuse, it’s doing it all by itself, which can be very distracting. I had an art class last night. Thankfully my job as the teacher’s assistant for demonstrations that night kept me from really digging into any project, because my mind was so scattered (thoughts of how to do the rewrite kept popping up), I would not have done a good job anyway. My instructor, bless her, was so understanding (“Why on earth are you not out celebrating! !”), she let me leave an hour early. I was accomplishing absolutely nothing in class. So, I’m writing today — but not editing, as my mind would really prefer. It’s all the art of compromise. It seems satisfied that I am at least writing. But, I will have to get into the real world soon to run errands, do chores around the house…then we’ll see if this bit of writing was enough for my writerly mind — appeasing it long enough for me to do what needs to be done without the constant chatter, telling me what changes need to happen. Tomorrow, another attempt at working on art in class. The weekend will come soon, and then rewriting begins, getting ever-closer to the final goal of a completed novel for publication. Be still, my heart. It’s hard to contain my joy. IT SEEMS, 2012 WAS A YEAR OF LOSS for so many of my friends. As we headed into the new year, yet another friend was admitted to the hospital…what a way to end the year. As I write this, I know he has lost his battle to remain with us — and is now home with his Father in heaven. My prayers continue to go out to his family, for strength, courage and peace for all of them to more that endure whatever lies ahead. That is my wish for anyone dealing with any kind of illness, whether it leads to a physical death or simply a lingering, chronic issue — even financial issues that threaten to smother — things that one must live with daily. Strength, peace…courage live beyond it. There is loss that friends — anyone, actually — find themselves dealing with. The death, or loss, of being actively healthy, unable to engage in normal activities. This loss is something that some don’t know how to cope with when the situation confronts them. Finding strength to carry on, often times with overwhelming limitations can be extremely difficult. Peace of mind, knowing that quality of life can exist, even with these limitations is so hard to grasp. Facebook (all those shared posts) — and the internet as a whole — is filled with examples of how people have overcome adversity in their life and not just trudged through life, “getting by”, but embraced and celebrated their life, living it to its fullest extent. It is a mind-set, to be sure — how one looks at things. The proverbial “half-full vs half-empty” cup in ones life. But, it also takes courage. Strength. And faith, whether in oneself or in a higher power. Personally, this soul believes in that higher power as the absolute, main source to draw from to garner the courage, the faith, the strength — and anything else needed to carry on. That Someone to lean on. He has helped me through so many problems, carrying me, lifting me up when I am down; opening my eyes to the beauty around me when all I can see is dark shadows and despair. Helping me to move beyond the pain that I live with daily. I am so glad that I never have to worry about Him ever leaving me. He will be with me to help me through each day, unlike some people in our lives that come and go. Life is ever changing. He never changes. He remains faithful to his promises. My life is richer. More fulfilling. Yes, still dealing with pain which will progressively worsen, but there is so much more to life than this pain. Way too much to let it get in the way. I’ve decided (there’s that mind-over-matter thing) that I’d much rather live my life to its fullest extent than let life simply pass me by. To let pain hold me back. It’s just too darn beautiful out there. Too many wonderful experiences, people to meet, and interactions to be embraced to let the shadows overwhelm life. If each of us could do that — engage in life, rather than merely live it, grumbling about our fate, trudging through life from day to day, our lives would be so much richer, whether we have overwhelming odds to deal with or whether it is just the “normal” ups and downs that occur in each of our lives. May your life be coloured with a rainbow of experiences, creating a beautifully rich, complex portrait, with Light overshadowing the darkness. WHO KNEW BEING A CHAUFFEUR could be so much fun! Well, okay, not a paid chauffeur. I donated my time and car when my sweet daughter planned a wine tasting tour for her husband as a belated Valentine’s Day gift but wanted to be able to enjoy herself also, yet be responsible without having to be the Designated Driver. I cheerfully obliged her request. The plan was for Saturday, so I blocked the day off. After a little ‘back and forth’ and lots of luck (my Friday class cancelled…amazing! ), she switched it to Friday. The plan went well, though in theory, it was supposed to be a complete surprise. Except, she decided he needed to be in on the choices for the wineries they would go to. And he knew I was the driver. And at one of the wineries, he overheard her mention the restaurant, I think. So much for surprises…and they decided, since all the tasting rooms were within a half mile of each other, they would walk between them. I must admit, it was a gloriously beautiful day — 80 degrees in February! So, after a little few hiccups (I forgot to fill up on petrol the night before, so had to take care of it before leaving town & then realised I forgot my laptop when I was halfway there), I arrived all spiffed-up in slacks, blouse, jacket and hamburg-style hat and opened doors of the car for them, then drove them into Carmel Valley. 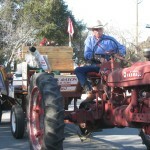 Just before arriving at their first destination, I rounding the last corner to find a large tractor, pulling an open-bed wagon parked mostly in the center of the road, blocking cars that were parked in front of several businesses — and truly a hazard to surrounding traffic. Maneuvering around it, I delivered them to their first stop (well, at least near the first stop–the address they had was a bit off). After obtaining a wine tour map from a nearby establishment, they wandered off, hand in hand, leaving me to my own devices for several hours. Thinking about my options, I sat in the car for a bit, surfing the web (aka Facebook) and read my emails on my iPhone–thank goodness for smart phones! Then I went into a local Fine Arts Gallery to check out their wares. Did I mention it was also had a wine tasting corner? As I perused the art, I inhaled some fine wine fumes wafting my direction. It was almost like incense filling the air. Lovely, if you aren’t in there terribly long. I wended my way out the back entrance to look at garden art — and a gulp of fresh air — before moving on to ponder my next move. “I can park this tractor where ever I want.” I think he’s right! advantage of the moment. I quickly took my shot and made my decision to visit the cafe that was next door, for some tea. And cake. Oh, dear (I decided to ignore my little voice telling me “NO!”). Service was great–even though I was buying so little, and the dessert (a ‘flourless’ chocolate tort–yum) was delicious. this, and more! 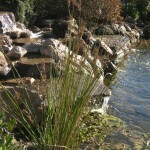 While I grabbed photos and wandered around, frogs began singing. One more thing I love! I actually videoed the unseen chorus for a few moments (I won’t bore you with the video). Lovely! Then, the time finally came for me to get back to the car & my chauffeuring duties — off to Cima Colline’s Wine Tasting Room to collect JaDa, my nickname for the duo. I ‘broke the rules’ and partook in a wee bit of wine–just enough to colour the bottom of the glass–from two types of wine and decided to buy a bottle before we all headed for their final evening location: Stammtisch Restaurant, a delightful German cuisine establishment with a colourful owner. I’d been given permission to invite a friend and she met us there. The owner seated us at our two, very separate, reserved tables and we each had a lovely meal. I did sneak in a few papparazzi shots (promised they’d be for their eyes only…sorry) during our meal, then completely surprised them by paying for their meal. My very unplanned Valentine’s Day gift to them — my ‘thank you’ for a wonderfully spent day. A day that would never have happened had their plans been different. I definitely liked being a chauffeur for a day. A mix of fun, ‘business’, family, friends, noshing, sight seeing and work, all woven together in a memorable tapestry, creating a wonderful day in my life! Nice! FINE. I’LL HAVE TO ADMIT IT. MAYBE THE DOC was on to something. I had a splendid week, full of energy that I haven’t been able to muster for…I can’t remember how long. I’ve gotten more of my novel written this last week than I have since NaNoWriMo ended! Chores done that have languished for ages. In addition, I’ve slept like the proverbial baby! A wonderful feeling! And it began the day one doc told me I might have SAD. That’s Seasonal Affective Disorder, in case you were wondering (seasonal depression caused by lack of sunlight), which is weird because you wouldn’t think California would be too far south for it. I thought about it as I waited, freezing to death and using the delightful sun as a way to keep warm, for my next appointment. After about fifteen minutes in the sun, the doors opened and I went in (to warm up) for a revisit with another doc. Now that my throat had cleared up he was able to give me a better diagnosis of an underlying problem. Now, two problems reasonably resolved. I left his office feeling better, finally able to put a name on the face of one of my dragons. The sun shone down, even as it started its last dance in the western sky just above the horizon. Energized. SAD? I think not. By the end of the day, I was feeling better. Not as fatigued. Able to easily stay awake to watch the late news–something I haven’t been able to do for months. That, in itself was invigorating. As the week progressed, the sunny days buoyed me, keeping me warm. I was back to my old self…well, almost. My sinus infection was finally gone too, but the sinuses were still talking in whispers (forever-allergies will do that). I could certainly live with that! Uncertainty has a habit of dragging me down. When faced with a problem, I must know the why and what so that I can move forward. Not knowing drains me. Just all my exaggerated aches and pains, some with known causes, some not, were slowly draining me. These last two days grew cloudy, with only glimpses of sun. My energy seemed to take a bit of a nose dive. And, sadly, my old sleep patterns returned. So, now, new questions arose. Perhaps I am. Perhaps I should just let life happen and quit requiring those whys and whats. Simply put it all in God’s hands, get out of the way so He can do His job, and move forward. It is much harder than it sounds, but well worth the attempt! I foresee this child doing a give and take with that for years to come, but hopefully, when I finally remember to give it to God, I’ll let Him keep it a little longer each time until finally surrendering each problem, each worry — each health issue — forever. In the meantime, the groundhog has forecast an early spring, so I’m looking forward to renewed energy staying with me for a long time to come, especially if I cloak myself with the promises He has given me. I can deal with my chronic aches and pains as long as I have Him to turn to. Happy belated Valentine’s Day and a beautiful Spring to come — watch it emerge with new life and rejoice. EVER SINCE THAT LAST POST, I’VE HAD PEOPLE ASK ME more questions about my girls — and wanting to see pictures (no, I don’t carry photos of my Girls…they are not my children, but I sure do love ’em!) of who’s been laying those precious gems. So, I decided to incorporate photos of them and a very quick little bio on each (and I’m going to apologize now–just saw how long this ended up–who knew it’d be so long! Guess I could do it in two installments…not — sorry!). I have twelve beautiful girls. Amongst them, there are three sets of ‘twins’ — I bough a number of breeds, buying them in twos…my ‘twins’. 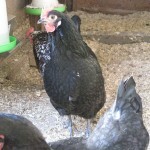 My ‘twins’ are Australorp, Silver Laced Wyandotte, New Hampshire Red and Ameracauna (Easter Eggers–my ‘blue’ egg layers). I’ll start with the ‘fraternal’ twin Ameracaunas (also known as Easter Eggers because of the rainbow of colourful eggs they lay…anything from different shades of blue to green to pink) — they look nothing alike, other than the beards & tufts along the side of their faces. when she’s on the nest. It’s as if this is the most uncomfortable thing to do and this last place she wants to be. She makes the funniest noises while she is sitting there — little grunts, squawks and groans, waiting for the egg to “pass” — her ‘gall stone’, I guess. Makes me chuckle, but then…isn’t it like giving birth — every single day?? Oh, my! Looks like I’ll be getting 4-5 eggs/week from each of these Girls. These two are skittish little girls, quiet one minute, then zooming from one end of the coop to the other for no apparent reason. Fun to watch and a challenge to photograph. Dottie and Lacie are my two sweet, little Silver Laced Wyandottes. through the winter without blinking. I think I’ve been averaging 5-6/week from each of them. 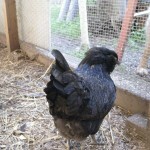 Um…well, Shazza or Mez — one or the other…can’t tell them apart, my Australorps. marked. When they were younger, there was a definite size difference, but as they matured, they look so much alike it’s ridiculous! These two gorgeous birds are so quiet and docile — I love them to death! 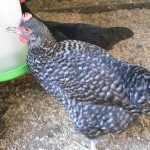 They lay light brown eggs and average 6/week. Then, there’s a very nosy, precocious Maranda, my French Cuckoo Marans (yes, Marans, not Maran–but it is pronounced like Maran). 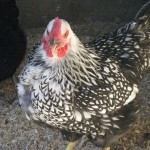 Her black and white specked coat of feathers is pretty. Not my favorite, but very pretty. She’s my biggest Girl. I think she is the “Alpha” hen in the coop. 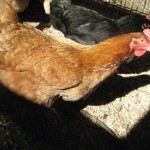 Early on, she was a very bossy girl, but has mellowed since she began laying her rich brown eggs. She doesn’t lay well in the winter, so she starts out strong — almost daily, then peters out to zero…we’ll have to see how she does after she starts back up. If I feel someone pecking at me, it’s Maranda. I have a hard time getting a photo of her because her face is always a quarter inch away from the lens or she’s shadowing me as I walk around the coop. name–when one comes along, I’ll change it). She seems small next to the New Hampshires, which I’m not used to–the one I had in the past was larger, I think. She is another quiet layer in my coop. 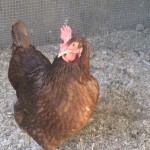 Her beautiful brown egg, about 5-6/week. She did slow down for about a month (during the shortest days), but has picked up production again. 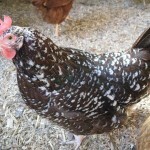 Specks, my sweet Speckled Sussex. I may have to rename her to CK (after Steve McQueen’s character’s nickname–Cooler King–in the Great Escape because he tried to escape so often)…every time I open the door, she tries to get out now! when I first saw her feather out. But when the sun catches hold of the rainbow of coloured feathers, it is a spectacular sight with undertones of green and blue. Purdy birdy! Specks lays a very light brown — almost pink egg — I call it my blush egg, and she too slowed down a tiny bit in December, but is working back to approx. five a week. 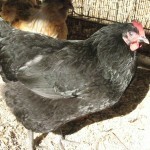 Flecks, my egg-laying machine Black Star. flecks of gold (hence, her name) on her breast. From above and behind, she’s hard to pick out when she’s with the Australorps…makes me think one of her parents was an Australorp. 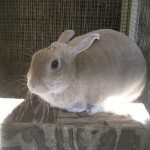 She was bred to lay eggs. And lay, she does. Every. Single. Day. She is an egg laying machine, no matter the weather or season. I’m guaranteed of at least one egg a day with this Girl. 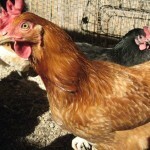 I thought I’d end the list of Girls with my ‘twin’ New Hampshire Red hens. QT (Cutie), my other far less vocal New Hampshire Red. neighbours! QT (Cutie) is just the opposite of CC: quiet, docile and follows CC almost everywhere. 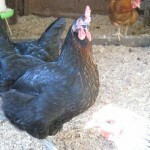 They lay brown eggs, 5-6 days/week. You would think I’d be happy with an even dozen Girls. 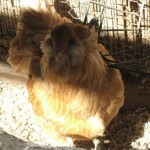 This is a very addictive habit–raising chickens…I’ve already lined up an order for another twelve (or so) Girls. This time, I am getting some ‘true-blue’ egg layers: the Aracauna; three extremely dark brown egg layers: Barnevelder, Partridge Penedesenca & Black Copper Marans, and maybe a Buff Orpington (an excellent setting hen…I have plans–maybe…wink, wink). But, that won’t be till April, so I have a lot of work to do before then, preparing brooding pens with heat lamps — and all the other stuff that’s been on my list to do, but too cold or wet to accomplish. 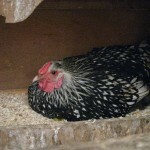 their coop-mate–in a cage, within the coop. Once I have all the construction done, she will be allowed to stretch her legs in the 8×20 coop, whilst the other Girls will get to go out into the outer pen. Until then, she is stuck in her dinky ‘prison’. I derive nothing but pleasure from this little ball of fur. The girls get under her cage and scatter the droppings, so there isn’t even the odd bit of poo to collect for fertilizer–at least, not until I do the semi-annual coop clean-out in a couple of months. So, I’ll end on that sweet note. It’s a beautiful day outside — way too nice to be inside on the computer. Ha! that means you too! Spring is just around the corner…I can feel it! Get out there (step away from your computer, please) — whether it’s sunny, cold, snowy or just plain ol’ wet. Relish it, whatever the weather– and enjoy your day that God has given you.